Did you catch the buzz? Today is Blog Action Day, when bloggers around the world are asked to bring attention to one social issue. Last year it was the environment; this year, it's poverty. It's the kind of easy feel-good meme that the Internet loves -- and that can reward participating blogs with a boost in web traffic -- but what are the real rewards for the cause? So, is Blog Action Day just so much well-intentioned “hot air”? Or is there a real benefit here to those who live in poverty, and to the organizations that dedicate every day to fighting poverty? and uncountable readers who come to the participating blogs through search engines results or links from other sites and various social media platforms. Those 10,998 sites are just the ones that registered formally at the Blog Action Day site — and it’s clear from last year’s experience that many more feel moved to participate, even several days later, when they begin to read what others have written. What wouldn’t any of us give to draw that kind of public attention to the causes we care most about? And the conversation doesn’t stop when the clock strikes midnight. The blog posts that went live for Blog Action Day 2007 are still there in the search engine indexes, still turning up to nudge new readers today, a year later. And many of the best will still be out there next year, continuing to raise consciousness, one reader at a time. And the charity websites that got links from all those blogs will continue to benefit, to some extent, from both the boost in search engine rankings and the increased visibility online. It’s a way of lifting a cause of global concern into the public spotlight, and bringing it front-of-mind to a broader audience. 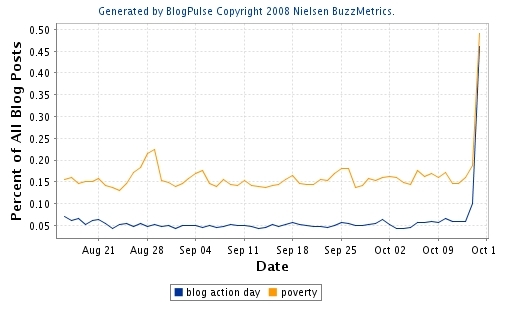 Among all the poverty-themed blog posts that hit the internet for Blog Action Day 2008, I find it interesting that some of the most compelling pieces are written by bloggers who’d normally dedicate their pages to business, productivity and technology topics, not to social action. While we’re living our online lives, there are hideously large numbers of people fighting tooth-and-claw for theirs. People who share the same planet and breathe the same air and who really need our help. And The 22% Club distracts us from that. By plugging in, we’re switching off. Blog Action Day exists to help us all wake up to the reality. In the near future it’s possible that the inability to use (or disinterest in using) the internet will become a contributory factor in poverty — work that doesn’t in some way use it will become rarer and rarer. Social media can help in the fight against poverty, in a number of ways — but it’s still down to people. From Skelliewag’s suggestions of 30 Simple Ways to Battle Poverty with Technology for Internet users, to the group of Podnosh bloggers who offered free one-on-one social media tutoring to voluntary and community groups in their home city, to an international Design for Poverty Contest at Yanko Design web magazine — the sheer variety of initiatives is inspiring. So maybe that’s another benefit of Blog Action Day 2008? Not merely “hot air” but a “breath of fresh air” — an injection of new energy and ideas for those who struggle with the world’s most pressing social issues, day in and day out, from within the nonprofit sector. What's caught your eye around the 'Net, on this Blog Action Day? indeed. read a post at problogger which was rather surprisingly compelling. and i've been seeing a number of blogs offer to donate $x per comment, that sort of thing. I say that any time your name is in front of people, it's a good thing. As people begin to ripen for change, any information that comes their way has a higher chance of tipping the scale. For example, when I decided that it would be wrong of me to keep profits from my Squidoo lens that featured hand crafted items and was promoting political action to help small businesses, I switched the "profit" mode over to 100% to a micro-loan charity. I'm now considering making all of my food lenses 50% in favor of a world hunger charity, once I pick one. Perhaps my book lenses will donate to a literacy program? And just a few weeks ago, I didn't want to give at all, because I thought I needed the money. This is a strong encouragement for the rest of us to get on board for the 2009 Blog Action Day. Count me in. This is a good analysis and I'm glad you shared it! Being one of those people without experience working for a social cause, I can certainly understand the cynics who are looking for the Action in today's event. However, I felt compelled to participate. It was a chance for me to explore a topic that I take for granted, even though "We're all just two paychecks from the street". I must say this: having participated, I now feel obligated to continue learning as much as I can about the proposed solutions so that, when it IS time for me to take action, I will be taking correct action. A great roundup, Rebecca. You tread the same line between scepticism and enthusiasm for the idea that I followed, but it's great to see that the event looks to have been a success for the charities involved. I only wish that participants had been encouraged to promote a single call to action instead of a slightly woolly one; having 12,000 voices asking for the exact same response from their readers could have gone a long way to boosting the impact of such a well-organised and heavily promoted event.